Antiasthmatic drugs are medicines that treat or prevent asthma attacks. Bronchodilators relax the smooth muscles that line the airway. This makes the airways open wider, letting more air pass through them. These drugs are used mainly to relieve sudden asthma attacks or to prevent attacks that might come on after exercise . They may be taken by mouth, injected, or inhaled. Corticosteroids block the inflammation that narrows the airways. Used regularly, these drugs help prevent asthma attacks. Those attacks that do occur will be less severe. However, corticosteroids cannot stop an attack that is already underway. These drugs may be taken by mouth, injected, or inhaled. Cromolyn also is taken regularly to prevent asthma attacks and may be used alone or with other asthma medicines. It cannot stop an attack that already has started. The drug works by preventing certain cells in the body from releasing substances that cause allergic reactions or asthma symptoms. One brand of this drug, Nasalcrom, comes in capsule and nasal spray forms and is used to treat hay fever and other allergies . The inhalation form of the drug, Intal, is used for asthma. It comes in aerosol canisters, in capsules that are inserted into an inhaler, and in liquid form that is used in a nebulizer. All three types of drugs may be used in combination with each other. Cromolyn is a common but not invariable first choice for children who have asthma. It reduces the frequency of asthmatic attacks and is suitable for long-term use. Cromolyn may not be needed when attacks are mild and infrequent. Bronchodilators should be used to treat attacks once they begin. They may also be taken on a regular basis to prevent attacks. Corticosteroids are valuable, but some have serious long-term side effects. Except in patients whose conditions cannot be managed with cromolyn and brochodilators, corticosteroids should be reserved for emergency room use. In patients who require ongoing use of steroids, alternate day dosing or inhalation of some of the newer corticosteroids may minimize the adverse effects of this class of drugs. 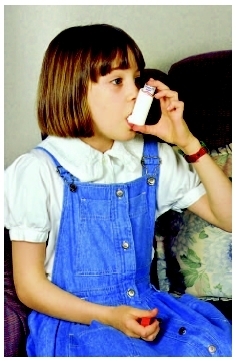 A young girl suffering from asthma uses an inhaler to assist her breathing. Using antiasthmatic drugs properly is important. Because bronchodilators provide quick relief, some people may be tempted to overuse them. However, with some kinds of bronchodilators, doing so can lead to serious and possibly life-threatening complications. In the long run, patients are better off using bronchodilators only as directed and also using corticosteroids, which eventually will reduce their need for bronchodilators. Parents whose children are using their antiasthmatic drugs correctly but feel their asthma is not under control should see consult their child's physicians. The physician can either increase the dose, switch to another medicine, or add another medicine to the regimen. Corticosteroids are powerful drugs that may cause serious side effects when used over the long term. However, these problems are much less likely with the inhalant forms than with the oral and injected forms. While the oral and injected forms generally should be used only for one to two weeks, the inhalant forms may be used for long periods. When used to prevent asthma attacks, cromolyn must be taken as directed every day. The drug may take as long as four weeks to start working. Unless told to do so by a physician, patients should not stop taking the drug just because it does not seem to be working. When symptoms do begin to improve, patients should continue taking all medicines that have been prescribed, unless a physician directs otherwise. Inhalant forms of antiasthmatic drugs may cause dryness or irritation in the throat, dry mouth, or an unpleasant taste in the mouth. To help prevent these problems, patients can gargle and rinse the mouth or take a sip of water after each dose. Inhalant —Medication that is breathed into the lungs. Nebulizer —A device that turns liquid forms of medication into a fine spray that can be inhaled. More serious side effects are not common when these medicines are used properly. However, parents whose children have unusual or bothersome symptoms after taking an antiasthmatic drug should get in touch with the child's physician. There are many drugs that are used in treatment of asthma. Interactions should be reviewed on an individual basis. All health professionals with responsibility for an asthmatic's drug therapy should have an up-to-date list of the drugs and doses being used by the child. Asthmatic children should wear a suitable identification bracelet with a list of drugs being used, in case of an emergency room admission. Children using inhalers should be knowledgeable on the use of these devices. Raskin, Lauren. Breathing Easy: Solutions in Pediatric Asthma. Washington, DC: Georgetown University, 2000. Allen, D. B. "Systemic effects of inhaled corticosteroids in children." Current Opinion in Pediatrics 4 (August 16, 2004): 440–4. Berger, W. E., and G. G. Shapiro. "The use of inhaled corticosteroids for persistent asthma in infants and young children." Annual Allergy Asthma Immunology 92 (April 2004): 387–99. American Academy of Allergy, Asthma, & Immunology. 555 East Wells St., Suite 1100, Milwaukee, WI 53202-3823. Web site: http://www.aaai.org. "Pediatric Asthma." MedlinePlus. Available online at http://www.nlm.nih.gov/medlineplus/ency/article/000990.htm (accessed December 19, 2004).